HIGH QUALITY HANDMADE KNIFE WITH SHARP, STONG, AND DURABLE BLADE The Nescole 8 inch Damascus Guard Bowie knife was made with the upmost attention to quality and detail. It was hand forged with carbon steel using the legendary technique of Damascus Bladesmiths that has been used for thousands of years. These knives have proven to last for centuries and your Nescole Bowie knife is no exception. PERFECT OUTDOOR, HUNTING, CAMPING, and BUSHCRAFTING KNIFE The Nescole 8 inch Bowie Knife is not just a good camping knife, it's the best camping knife. It's rugged, manly design makes it the perfect addition to your outdoor survival tools, whether its being used to open an aluminum can or to hunt some wild animals, this beautifully crafted knife will not disappoint. 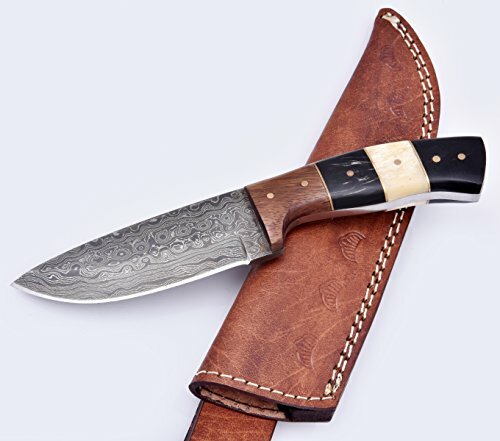 DECORATIVE BOWIE KNIFE FOR COLLECTORS When you're not using your bowie knife in the great outdoors, you can put his beautifully handcrafted piece of art up for display in your home to let other admire the beauty and craftsmanship. WILL NOT RUST WITH PROPER CARE Your Handmade Damascus Steel Knife will last you for years with the proper care. Here are our suggestions to keeping your blading looking beautifully without any rust: Hand wash the blade with soap and warm water after every use. Towel dry- make sure that knife is completely dry before returning to the sheath. Oil the blade after it is completely dry. Make sure to oil your blade frequently as carbon steel can and will rust without proper care. However, rust can be prevented by oiling your blade. Do not leave the knife in the leather sheath for long periods of time. If you have any questions about this product by Nescole, contact us by completing and submitting the form below. If you are looking for a specif part number, please include it with your message.